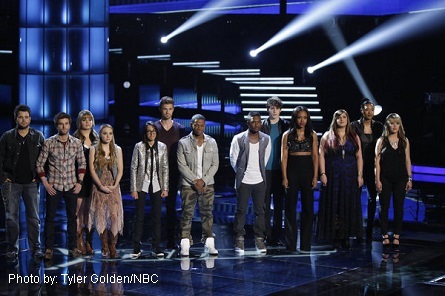 America Voted For Their Favorite Ten Voices, The Live Eliminations Results Are In! 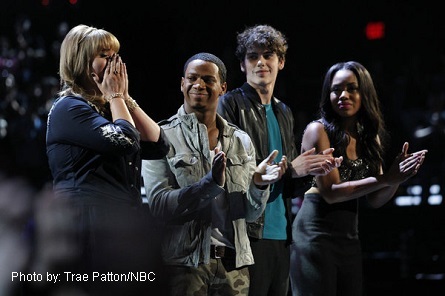 The first night of “The Voice” live performances where America votes has the contestants and mentors back at the Universal stage where they are all fighting the heat through a barely bearable non-conditioned room as host Carson Daly announced at the start of the show that the air conditioner had gone out. Pictured: The last time the twelve contestants stand on THE VOICE stage together. 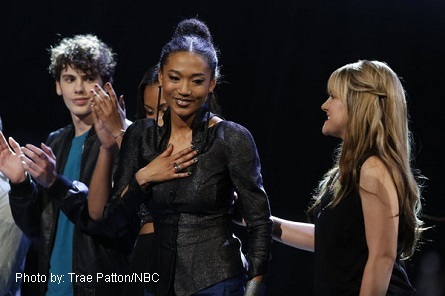 The twelve contestants who were selected by America last week to move-on in the competition and in the live weekly performances all sang tonight in order to gain more of America’s votes to continue to remain each week to be the winner of “The Voice.” See who gained enough votes to continue in the competition. Two contestants did not garner enough of America’s votes and were sent home in night two to give America their ‘Voice Top Ten singers. Unfortunately, America did not vote to keep Vedo in the competition and he was eliminated. Holly has made several of her own records which, as Blake said, “shows that it’s not a hobby.” Tucker sang “Broken Wing” by Martina McBride. 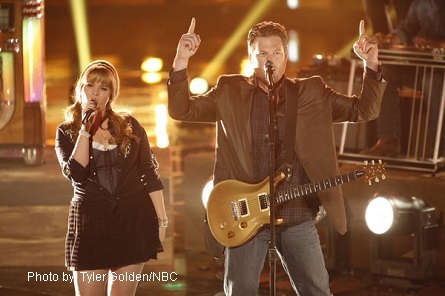 Pictured: Holly Tucker and Blake Shelton perform. Pictured: (l-r) Holly Tucker, Vedo, Garrett Gardner, Sasha Allen. Holly Tucker was the ninth save of night two. “I was playing a guitar by myself. A kid walked-up and said ‘why are you so weird?” – Garrett Gardner. Gardner put a new spin on an old popular boy band song by singing “I Want It That Way” by The Backstreet Boys with not a lot of positive responses from the mentors. It was wishful thinking for mentor Shakira. Gardner was voted off. Sarah said that her mother talked her into doing two pageants as a way of her getting her singing out there. It was revealed that Sarah was America’s third save of the night. The “Swon Brothers” sang “Who’s Gonna Fill Their Shoes” by George Jones. The Swon Brothers said that they did a variety show where they did Elvis. Pictured: Zach and Colton of The Swon Brothers. 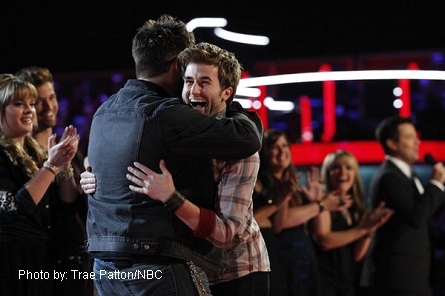 “The Swon Brothers” were the second contestants to be saved by America’s votes. Sasha sang “How Do I Get You Alone” by Heart. Her performance included some of Shakira’s signature voice rhythmic quails. 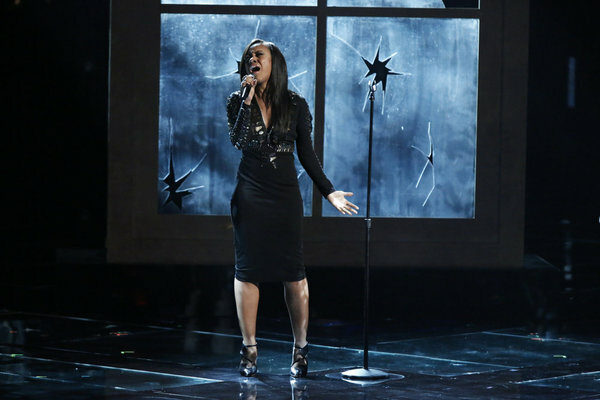 Responses on her performance included: “Every week is another reason why I should have never let go of you. You’re amazing” said Adam. The votes revealed that Allen was America’s tenth save of the night. Hawley was the fourth save of the night. Danielle said, “I want to be a country pop artist. I know I can do it.” She sang “Wasted” by Carrie Underwood. America voted to keep Danielle and made her the sixth save of the night. It was revealed that Hill was America’s fifth save of the night. America voted to keep Chamuel in the competition. She came in at save number seven..
“I consider myself to be a crooner.” – Kris Thomas. Thomas said he almost joined the Army just two weeks before “The Voice” called him to be on the show. He sang “I’ll Be There” by The Jackson 5. Mentor Shakira stated, “So much sweetness and honesty at the same time. You should feel very accomplished today. I’m very proud of you. 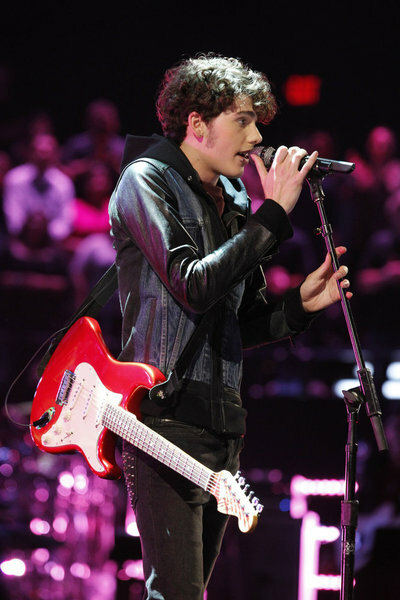 Thomas was America’s first save to remain in THE VOICE competition. The last performance of the night was a Mother’s Day dedication. 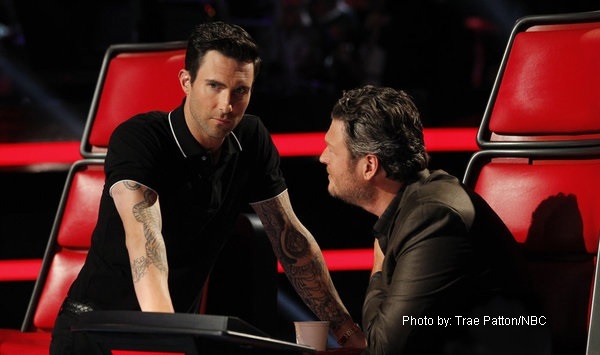 Amber said “I want to cross-over [from country] to pop which is why Adam is the best coach for me.” Adam said, “Her heart is in country music. 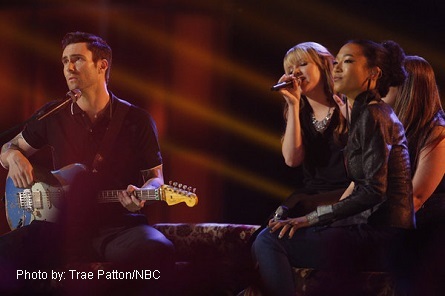 I’m really excited to see what this girl can do.” Amber sang “I’m Gonna Love You Through It” by Martina McBride. She dedicated the song to her mother who died of cancer at the age of 38. Carrington was America’s eighth save.